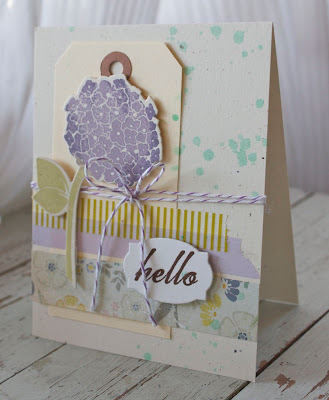 I'm squeezing in some blog time this morning with a a pretty little card using Papertrey's Happy Hydrangea stamp set + it's coordinating die. Base paper is Rustic White, my go-to card base. I used a Large Manila Tag with Washi tapes and patterned paper strips on top. The sentiment is stamped on a Framed Out #4 Die. Purple baker's twine finishes off the card front. 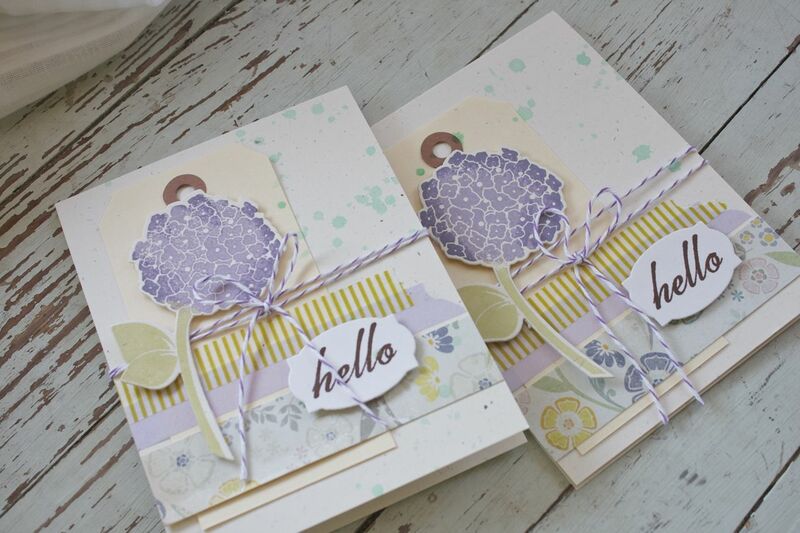 A nice little duo to go in the mother's stash of cards for upcoming birthdays. So, whatcha got on your plate? Lots of stamping projects planned for the Summer? I've got a long list of to-do items and am going to try to whittle away at them a little bit at a time. Have a great day everyone! Summer hasn't started here yet. My daughter is waiting for her high school results (next week) and my son still has 3 weeks of school. And it's raining! Love the card. My hydrangeas are in bud and a little bit of blue is shining through. It's our first day of summer break out here..debating whether or not to make a break for the beach..or take a day off to just hang out. My 3 kiddos are still asleep, so for now I'm planning on sneaking over to my craft zone for some PL-ing...I'm sooooo behind! Cute cards Michelle! I retired 6 weeks ago so I am super excited about summer. It will include more time with my grandchildre,cookouts,stampin" and just plain relaxin'. Hope you have a great summer. These cards are beautiful, I love how you incorporated the washi tape, I am now starting a "collection". I did sign up and start the Pieces of Me workshop on 2peas (your inspiration) so I am excited to dig into that and continue to work on my journal, she had a lot of great ideas for page entries that I had not thought of. Sent out 8 b-day cards last month and about 10 thank you cards in the last week so I will be working this week on getting more made to build my stash back up, and taking a road trip on Saturday, planting herbs on Sunday. Lots of fun stuff for me, life is good. Love your card. I just received washi tape from my SIL that she brought back for me from Japan. I want to break it out now! Enjoy the pool! Your cards are so pretty Michelle! Will you have any more collaborative sets coming out with PTI this year? Your designs are some of my favourite stamps!